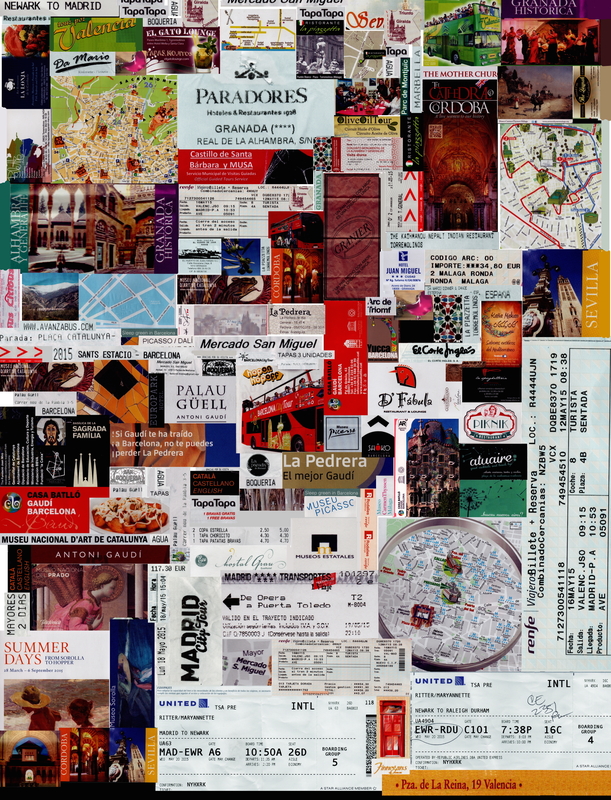 While in Spain in March through May, I collected receipts, tickets, business cards, maps and all sorts of paper memoirs of our trip. In June, I scanned them and arranged them into an 8×11 inch arrangement. Then I printed the page at 300% on Artist Transfer paper (16 pages in all). Before printing them, I had to make a mirror image! This is important or your designs will be backwards. The transfer paper is the same or similar to what you use to iron a design onto a T Shirt. Once printed, I trimmed the images and ironed them onto another piece of fabric. Here are the results! Click on it for a bigger image. I decided I didn’t want to cut into it… it measures about 20″ x 27″, so I printed two 8×11″ inch versions which I will use to create a tote. For these, I used ink jet fabric/paper that will run through the printer as if it is paper. For this fabric, you do not need to use the mirror image. Sometime in the future, I will make something from the larger piece of fabric, but for now, it is a good memoir just hanging on my design wall. This entry was posted in Fiber Arts and tagged Spain, TAP. Bookmark the permalink. Love this piece! Wanted you to know that the next Art on the iPad course starts Sept. 22, early bird discount price through Sept. 7, details on my website at http://www.susiemonday.com. Thanks Susie. I do plan to sign up around the first of September. Looking forward to it. I love how your colors all work together. The arrangement of memorabilia works really well. It will be a great piece to look back on and remember all those places and the times you shared on your trip.